Braided Pink Rope made from 8-plait multifilament polypropylene for a soft, flexible, strong and UV resistant cord. Diameters 6mm, 8mm, 10mm and 12mm supplied in lengths of 100m on sturdy plastic reels. 6mm x 100m 8-plait pink polypropylene rope. A soft, flexible, strong, UV resistant cord that floats in water. The picture we have used here is of our 8mm diameter. 8mm x 100m 8-plait pink polypropylene rope. A soft, flexible, strong, UV resistant cord that floats in water. 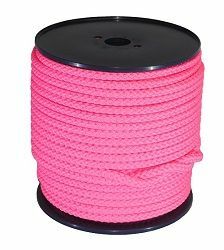 10mm x 100m 8-plait pink polypropylene rope. A soft, flexible, strong, UV resistant cord that floats in water. The picture we have used here is of our 8mm diameter. 12mm x 100m 8-plait pink polypropylene rope. A soft, flexible, strong, UV resistant cord that floats in water. The picture we have used here is our 8mm diameter.